101 of the Best Stocking Stuffers for the Whole Family - Lovely Etc. The best stockings are full of both fun treats and useful gifts. This list includes fun and useful stocking stuffer ideas for all of the kids, teens, and adults in your life. Stockings are a very big deal in our house. When I was growing up, our stockings were filled with a handful of candy and some fruit and were basically an afterthought. Not so at my husband’s house. Stockings were always his very favorite part of Christmas morning. They were filled with all kinds of fun things and he always opened his stocking last so he could savor it. He quickly converted me to his view of stockings which is frankly much more fun. Now our stockings are full of little treats and fun surprises. And over the past 15 years, I’ve learned a lot about what makes a good stocking. I love stockings that are full of true gifts – things you can use or really love. Sometimes it can be tempting to buy a bunch of cheap toys and Christmas ‘junk’, especially for kids’ stockings. But who wants to buy a bunch of stuff that is clearly going to end up in the garbage within a week? On the other hand, stockings can get pricey fast when you are filling them with real gifts that can actually be enjoyed. This is something I really struggled with at first. I am a major cheapskate and I frankly didn’t want to spend much money on stocking stuffers. But over time I realized that stocking stuffers are just as much a gift as a box wrapped under the tree; they’re just packaged a bit differently. 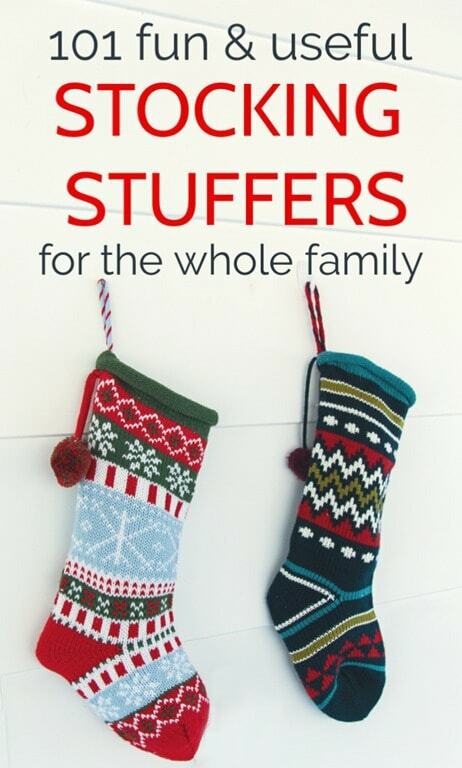 This list includes all of my favorite stocking stuffers for kids, teens, men, and women. I thought about dividing the list into stocking stuffers for men and stocking stuffers for women, but honestly most things just aren’t gender specific. Also, I love a good multi-tool so it just didn’t seem right to label it for men! So instead, I’ve divided things into categories. There are special treats to eat and things for pampering ourselves. There are super useful things we never think to buy for ourselves and fun luxuries we never splurge on. And there are some great ideas for kids too. I gave kids’ stockings their own section, but lots of ideas from the other categories are also perfect for kids’ stockings. I’ve tried to keep the commentary below to a minimum since it is a long list already and seriously, I know you are just here for some quick ideas. And for convenience sake, I’ve linked most things up to Amazon but almost all of these ideas can also be found at Target, Walmart, or even the Dollar Store. First up are a few tiny luxuries that make life more fun. I love this kind of thing but almost never think to buy them for myself and I bet I’m not the only one! Flower bulbs – This is the perfect time for planting some amaryllis or paperwhites inside to help beat the winter gloom. Magazines – You can grab a few from the checkout line at the store, or include a subscription card. Ok, admittedly this entire section is basically stuff for your smart phone. But considering how many tasks we accomplish with our phones, it’s no wonder they can use a few accessories to make it all go a bit smoother. And since nearly everyone has a smart phone, these gift ideas are crowd-pleasers for pretty much anyone including hard-to-shop-for teens. A spare phone dongle – if you have a newer iPhone or Google Pixel, you need one of these to use headphones. And yes, dongle is a super goofy word. Pop sockets – These little things are super useful. They work as both a stand and a grip to help you hold your phone more securely. An iphone camera lens – I think these Phone camera lenses are genius. They snap right onto your phone and allow you to take high quality wide angle or close up photos with your phone. Fun for anyone who loves taking photos. A magnetic car mount – These simple mounts attach securely to your car vent so you can use your phone hands free. These are especially great when you’re trying to use GPS to navigate and need to be able to see your screen. Sometimes the little things can truly make our daily lives so much easier. Each of these things will be used over and over but they make great gifts because we often forget to buy them for ourselves. Tile Mate trackers – This is one I definitely need! Just stick a tile on your keys, wallet, or whatever else you need to keep track of. Then if you ever can’t find it, you can use your phone to pinpoint it’s location and even make it ring. A pocket screwdriver set – This one will really come in handy on Christmas morning too if you have kids. We are always scrambling to find a little screwdriver to remove toys from their packaging and open the battery compartments. Dish scrapers – This may be the least fun thing on this whole list, but we got one last year and it has been a lifesaver. These nylon scrapers are so much better than any other type of dish scrubber/sponge/scraper I have ever used. Beard oil – The most hipster gift imaginable, but it truly is helpful in taming a beard. Essentail oils – I may be the last person in the United States who still hasn’t tried essential oils, but I had to add them to the list. For anyone who is interested in them (which is most people), these are the ultimate stocking stuffer. Gift cards make such perfect stocking stuffers, they get their own category. Pretty much anyone love a gift card to Target, but there are also a ton of other really fun options you probably haven’t considered. These fun little items fit well in a stocking and will definitely get lots of use. In my opinion, a stocking’s not a stocking without some sort of fun treats to eat. I love to put things in stockings that my family loves but we don’t usually buy on a regular basis like sugary cereals and pop tarts. Special candy – These are my favorites. Flavored coffees – Peppermint coffee is a must have in my husband’s stocking every year. Single serve coffee brew buddy – I just discovered this and it is so cool. It is a little reusable coffee brewer; you set it on top of your mug and pour in hot water to make one perfect cup of fresh coffee. I am always in the mood to get everything fresh and shiny and organized in the new year and these stocking stuffers are the perfect way to get a jumpstart. Chalk markers – I am a huge fan of chalk markers. They write on chalkboards like chalk but you can write much more neatly and you don’t get all the mess of chalk dust. Book darts – These are perfect for marking your spot in your book or marking passages you don’t want to forget. Bookmarks – You can get bookmarks pretty much anywhere, but this Loch Ness Monster bookmark swimming through your book is seriously the cutest. Let’s face it, kids are definitely the easiest to find stocking stuffers for. They love little tiny things of all sorts. Sometimes the only problem is figuring out which things they will love for the first ten seconds they see it and which things will continue to bring joy a little longer. I try to stick with stocking stuffers that will either be enjoyed for awhile or that are consumable and don’t just turn into piles of useless clutter. Kinetic Sand – This looks like such a fun way to play with sand without making such an annoying mess. Blind bags – For a long time I had no idea what people were talking about when they said their kids loved blind bags. In case you are in the same boat, blind bags are little bags that have a toy inside. They are called blind bags because you don’t know exactly which toy you got until you buy it and open it. Admittedly, this is the one thing on this list most likely to become junky clutter but my kids love them so much I usually put one in their stockings anyway. Lego tape – This is a must for Lego lovers. You can stick this tape on anything and then attach legos to it.